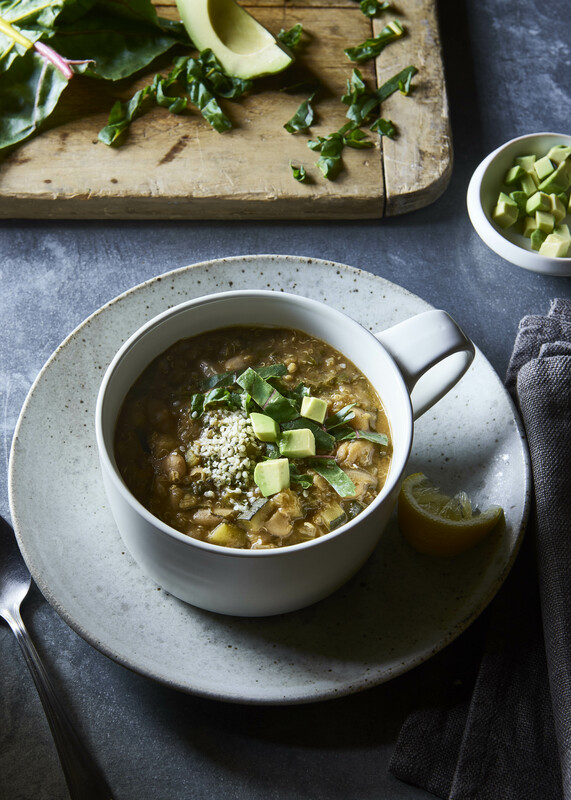 Packed full of onion, celery, cumin, paprika, cayenne peppers and even white quinoa, Tess Masters’ new White Bean Chili is a zingy recipe that packs a fiery punch of flavor! In a large saucepan over medium heat, warm the oil, and sauté the onion, celery, garlic, and oregano for about 5 minutes, until the vegetables are soft. Stir in the chili powder, seasoning powder, cumin, smoked paprika, and cayenne, and sauté for 30 seconds until fragrant. Add the broth, increase heat to high, and bring to a boil. Reduce the heat to medium-low, and simmer for 5 to 10 minutes until slightly reduced. Stir in the beans, quinoa, and zucchini, cover, and cook for about 15 minutes until the quinoa is cooked through. Add the chard, and cook for about 5 minutes until wilted. Add the lime juice, plus more to taste. To serve, ladle the chili into bowls, and serve topped with sliced avocado and hemp seeds.